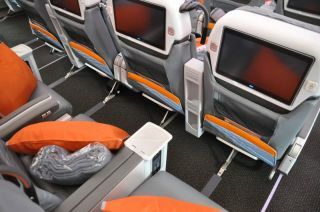 SINGAPORE - Singapore Airlines has introduced a system that would allow a few select passengers to bid online for a seat upgrade a few days before their departure. The city-state’s flag carrier, at its discretion, will invite fliers who have booked economy class seven days in advance to bid for its premium economy class, which offers relatively more comfortable seats, according to the company’s website. Results of the auction will be known 40 hours before the scheduled takeoff. “Invitations are made at Singapore Airlines’ sole discretion based on certain criteria and combination of factors, which are dynamic,” the airline said on its website. The system may be extended to other classes at a later stage, said Harry Chu, a spokesman. Asia’s premium carriers including Singapore Airlines and Cathay Pacific Airways Ltd. are facing intense competition from regional low-cost carriers as well as major rivals based in the Middle East. The fight to lure customers has eroded the revenue earned from a passenger for flying one kilometer, or yields, to a six-year low at Singapore Air, according to data compiled by Bloomberg.